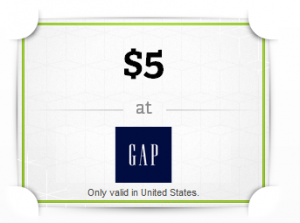 FREEBIE ALERT: FREE $5 Gap credit! If you love Gap, make sure you grab your FREE $5 Gap credit from Wrapp! Gap’s giving you $5 to kick-start your summer wardrobe and snag a sweet tee made by fans like you. Download Wrapp, the hot new social-gifting app, grab a friend, head to Gap, and get shopping! NOTE: You must have an iPhone or Android Smartphone to take advantage of this offer. Your promotional code is valid for 30 days. Gap: Save up to 40% in stores and online + get an extra 10% off online purchases! If you are shopping in store, you can save 30% on select denim, too! This sale ends tonight! You can also get an additional 2% cash back when you shop through ShopAtHome.com or Ebates. Gap: Extra 50% off in stores! Gap has started their end of year sale and items are up to 60% off their regular retail prices! Today only (12/26), you can also save an extra 50% off sale prices in stores! When you shop online, you can get an extra 20% off on sale items when you enter the code GAPSALE at check-out! Shipping is free when you spend $50 or more (this is based on the pre-discount total). You can get 10% cash back from ShopAtHome.com, to! GAP: 20% off your total purchase + free shipping and cash back! Gap has some great promotions today! You can save 20% off your total Gap purchase online PLUS you’ll get free shipping and you can get 3% cash back from ShopAtHome.com. To get the most bang for your buck, click on the “Sale” tab and grab clearance items! Enter the code GAPCHEER at check-out to get 20% off and free shipping when you spend $50 or more (this is based on your total BEFORE the discount), too! Gap: Save 30% online or 40% in store + $5 off coupon! If you love Gap, they’ve got some GREAT deals right now! Since this coupon is good for $5 off ANY item, you may be able to use it to score free socks or other accessories. The 40% off coupon says that it cannot be combined with any other offers, so I’m guessing you can’t use the two coupons together, but you should be able to do two separate transactions to maximize your savings!